A rich cross-curricular resource for the primary school, embracing French, Geography/Development and lots more. Why not ask to see an inspection copy? 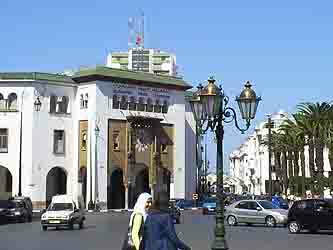 Main Post Office in the capital city, Rabat, was built by the French colonists while they ruled Morocco. Primary school teacher in Khemmiset. Some subjects are taught in Arabic, others in French. 1845 - Sultan of Morocco meets a gathering of tribespeople outside the walls of Meknès. This material is also included in French 3 as Chapter 6, "Welcome to Morocco"